On the heels of its first Falcon 9 rocket flight less than two weeks ago, SpaceX has inked a $492 million deal to launch a new fleet of Iridium mobile communications satellites beginning in 2015. "We're announcing today the biggest commercial launch deal in history, to the best of my knowledge," said Elon Musk, SpaceX's founder and chief executive. SpaceX will launch an undisclosed number of Falcon 9 rockets between 2015 and 2017 with Iridium's next-generation satellites into polar orbit from Vandenberg Air Force Base, Calif.
Musk said Wednesday the $492 million figure includes money for the design of a multi-satellite dispenser. The Falcon 9 rocket would launch several Iridium satellites at a time to altitudes of nearly 500 miles. Thales Alenia Space of France, Iridium's choice to build the 72 next-generation satellites, has just started designing the spacecraft, so officials aren't sure exactly how many payloads can fit on a single Falcon 9. Iridium will select one more launch provider as an alternative to the Falcon 9, but the company's top executive made it clear SpaceX will launch the bulk of the constellation. "That $492 million figure would launch all 72 satellites in our constellation," said Matt Desch, Iridium's CEO. In an interview Wednesday, Desch said Iridium will also seek an alternate satellite dispenser to go along with the other launch provider. Although Desch declined to discuss other launch options, Russian and Chinese vehicles could compete for the work. In the first round of competition, SpaceX came out well ahead of other companies with the best bang for the buck, according to Iridium. "I don't know that anyone would be able to give you the value for capability that SpaceX does," Desch said. Iridium's first-generation satellite fleet began launching in May 1997, using U.S. Delta rockets, Chinese Long March boosters and Russian Proton and Rockot launchers to loft satellites through 2002. The Iridium Next fleet will replace the company's existing constellation, which now includes 56 operational satellites and seven spares. 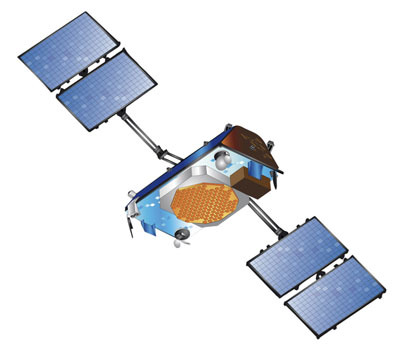 Iridium satellites provide voice and data communications to mobile devices around the world. The $2.9 billion rejuvenation program is being partially financed by a $1.8 billion credit facility from Coface, the official French export credit agency. Coface has issued a guarantee for 95 percent of the $1.8 billion credit line. The financing milestone was announced as Iridium unveiled Thales as the Iridium Next prime contractor. After Wednesday's agreement with SpaceX for launch services, Iridium will sign agreements for the ground segment and major subcontractors, about 40 percent of which will be in North America. "We're all systems go with Iridium Next," Desch said. "This is the third leg of the stool for us after financing and announcing the satellite manufacturer." 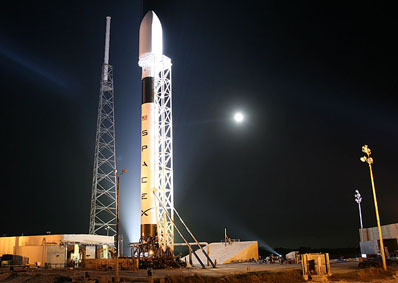 Wednesday's landmark contract announcement capped years of behind-the-scenes negotiations and talks between SpaceX and the mobile communications provider, according to Desch. The agreement was already planned before the June 4 blastoff of SpaceX's first Falcon 9 rocket from Cape Canaveral, Fla. The Falcon launcher got nearly perfect marks on its debut mission, reaching an accurate orbit even though its upper stage began an unexpected roll in the final moments of the flight. "We've been an early believer in SpaceX and have been cheering them on for years," Desch said in a Wednesday interview. "The success of a couple of weeks ago wasn't completely unexpected, but it was a very pleasant event for us." Musk said the Falcon 9 should rack up "a couple dozen launches" by the time Iridium flights begin in 2015. SpaceX will start launch pad construction at Space Launch Complex 4 East at Vandenberg next year, and the first Falcon 9 should blast off from the West Coast about two years from now, Musk said Wednesday in a media conference call. An extensive environmental study of SpaceX's proposed takeover of the SLC-4E pad is already underway. Musk estimated it will cost up to $50 million to outfit the complex for the Falcon 9, including removing old infrastructure, adding propellant tanks, building a hangar and installing tooling for the liquid-fueled rocket. The hillside pad was previously the West Coast home of the Titan 4 rocket. The Falcon 9 launch complex at Cape Canaveral was also a Titan pad before SpaceX took control. "We're using the same former Titan 4 facility at Vandenberg, so we really have a pretty good understanding at this point of what it takes to convert a Titan 4 facility to a Falcon 9 facility," Musk said. SpaceX was already planning two Falcon 9 launches of Argentine radar mapping satellites from Vandenberg in 2012 and 2013.